Very free flowering clone. Small, densely branched shrub with downy arching branches and small narrow leaves, grey-downy when young. Dense clusters of small white flowers all along the branches in April and May. Resembles Spirea 'Arguta' in general appearance. Any reasonable soil, in sun or part shade. Raised in Norway. 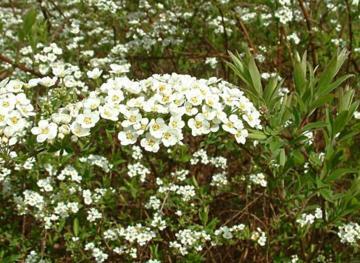 Hybrid of Spirea cana x Spirea hypericifolia.